A worm is used here as a lure. The definition of lure is something that attracts a person or animal, especially something used specifically for the purposes of attracting or baiting an animal. 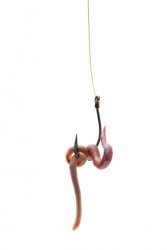 An example of lure is a worm used to catch a fish. An example of lure is a high paying job that attracts a person. To lure is defined as to purposely attract someone or tempt someone to do something, often using a reward. An example of lure is when you put out bait to try to get an animal to come to your trap. "lure." YourDictionary, n.d. Web. 17 April 2019. <https://www.yourdictionary.com/LURE>. a. Something that tempts or attracts with the promise of pleasure or reward: the lure of the open road. b. An attraction or appeal: Living on the ocean has a lure for many retirees. A decoy used in catching animals, especially an artificial bait used in catching fish. A bunch of feathers attached to a long cord, used in falconry to recall the hawk. To attract or entice, especially by wiles or temptation: Customers were lured to the store by ads promising big discounts. To recall (a falcon) with a lure. These verbs mean to lead or attempt to lead into a wrong or foolish course: Lure suggests the use of something that attracts like bait: Industry often lures scientists from universities by offering them huge salaries. To entice is to draw on skillfully, as by arousing hopes or desires: The teacher tried to entice the shy child into entering the classroom. Inveigle implies winning over by coaxing, flattery, or artful talk: He inveigled a friend into becoming his law partner. To decoy is to trap or ensnare by cunning or deception: Partisans dressed as simple farmers decoyed the soldiers into the crossfire. Tempt implies an encouragement or an attraction to do something, especially something immoral, unwise, or contrary to one's better judgment: I am tempted to tell him what I really think of him. To seduce is to entice away and usually suggests the overcoming of moral resistance: “The French King attempted by splendid offers to seduce him from the cause of the Republic” (Thomas Macaulay). (fishing) An artificial bait attached to a fishing line to attract fish. To attract by temptation etc. ; to entice. To recall a hawk with a lure. Anglo-Norman lure, from Old French loirre (Modern French leurre), from Frankish lothr, from Proto-Germanic *lÅÃ¾r-. Compare English allure, from Old French. Jackson frantically searched his mind for ways to lure him away from here. You can always walk away, she told him, repeating the words Darkyn used to lure her into the deal they made originally. At the very beginning of the war our armies were divided, and our sole aim was to unite them, though uniting the armies was no advantage if we meant to retire and lure the enemy into the depths of the country. And it had been Katie who sent him that picture - to lure him up here?